Lower Holker Parish is located in the south of Cumbria in northern England. The Parish Council was established under the Local Government Act of 1894 and held its first meeting on 4th December 1894 in the schoolroom. 108 people were present at this first meeting. The first Chairman appointed was Victor C W Cavendish and from the 13 Candidates for Parish Councillors, the following were elected: Benjamin Wilson, William Richardson Nash, Edward Drewry, David Hall, John Atkinson Hall, Joseph Westwood and William Postlethwaite Rigg. 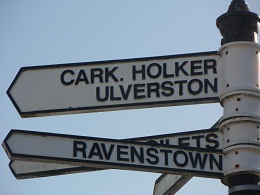 Until 1960, Lower Holker Parish came under Ulverston Rural District Council then North Lonsdale Rural District Council until 1974 when South Lakeland District Council was established following the Local Government Act in 1972. Until 1974, Lower Holker Parish was in the county of Lancashire and then became part of the new county of Cumbria during a reorganisation following the Local Government Act 1972.